I cannot believe it’s been more than a month since my last post, but August and September have been two very busy months, so I hope I can be forgiven. 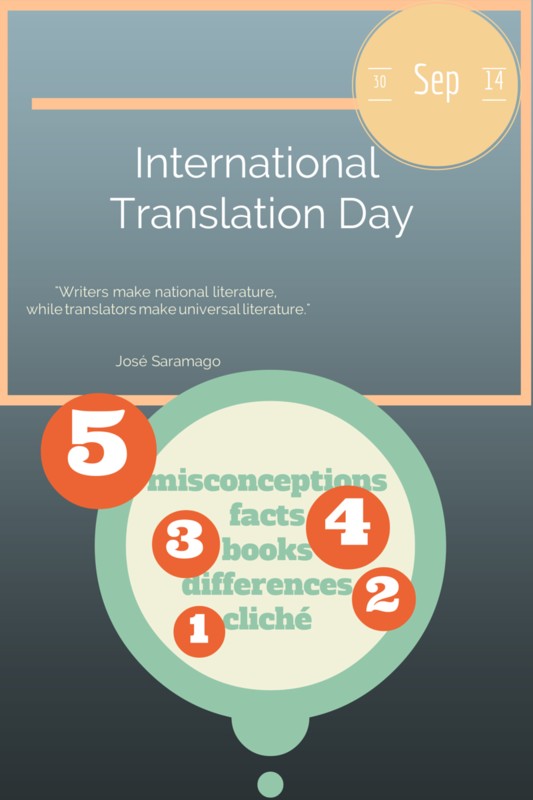 However, I could not have let this day pass without a special post dedicated to the International Translation Day. There are so many things that are worth exploring and talking about when it comes to our beloved profession, but I’ve chosen a few and I hope you’ll enjoy this post. BIG mistake! Bilingualism is merely about a varying level of comfort with two different languages; it is not a substitute for learning to be a professional translator. True, it is the starting point for any translator, but it is not sufficient in itself. There are several examples to prove the inadequacy of bilingualism in dealing with the many ambiguities that professional translation aims to eliminate. It is a mistake to assume that just because a translator is proficient in two languages, he or she can immediately and effortlessly translate anything between those two languages. Technical and domain-specific text is extremely difficult if the incumbent has no prior experience in those domains. The process will be slow and prone to errors. Another big mistake – sadly, one that only sufferers at the hands of poor translation are privy to. In many cases, a hobby translator can do the job just as well as a seasoned one, but for the most part, a non-professional translation is guesswork at its worst. Your budget will be the least of your problems if you unleash an untrained translator on your most valuable asset – your content. In three words: it is not! A professional translator should have a nimble mind capable of choosing the exact words and phrases that fit into a sentence without changing its meaning, intent or tone. This is where human intervention is most needed, because no machine can accurately (or more accurately than a human expert) translate a piece and have everything in order. Absolutely not! There is no way that a translator can give you high-quality output if the input isn’t superb to begin with. The only option is to first get the source material up to scratch, and provide the translator with every bit of contextual information possible. Anything less will show up in the results. Fact #1: The average translator’s output is between 300,000 and 1,000,000 words per year! Fact #2: Translation actually has a patron saint – St. Jerome. His translation of the bible, called The Vulgate, was written for the benefit of Latin-speakers in the 4th and 5th centuries A.D. Fact #4: Septuagint – a translation of the Hebrew Bible and other scriptures into a form of Greek (Koine) – is the name of the first translation in the classical world, because it was believed to be the work of 70 translators! There are far more differences between the skill requirements of translators and interpreters than there are similarities. There are domain-specific skills, culture-specific skills and several other skills that defy comparison. Simultaneous interpreting (the most well-known type at least among people outside the industry) is an ‘in the moment’ act. Often, an interpreter cannot even begin translating a sentence until it has been spoken completely. That leaves them only a fraction of a second to begin the translation, prepare to listen and interpret the next sentence, and effectively tie everything in to the theme of the discussion. Though translators face no less of a challenge in terms of complexity, the time-frame is vastly different. 🙂 Better late than never, you know what they say, Magda. I loved the ‘anacardi’ post. I too find etymology fascinating. Have you seen my post on the etymology of childhood games? I know what it’s like. I wish I had more time too. So many things to read, to do, to catch up with…. never enough time.